Hi, watchers and other visitors to this page! Real life has been quite a ride recently. I've recently finished up college, fallen in love, and have work. That means that my priorities have changed. In particular, I don't have the incentive to work on art besides that I'm personally interested in, so my gallery will be a lot less interesting to most. If you're watching me or planning to watch me because I make Pokemon sprites or doing cheap sprite commissions, well, I don't see myself working on more of those in the near future. I might as well use this journal to redirect people who did come to my page, then. If you are or you know an artist who makes Pokemon sprites or sprite commissions, tell me and I'll mention the artist in this journal. Just give me the artist's dA username and whether he/she makes Pokemon sprites, sprite commissions, or both. Listening to: Soundtrack to "Moana"
This time, though, I've found out the cause of this activity, and I think it's pretty neat. 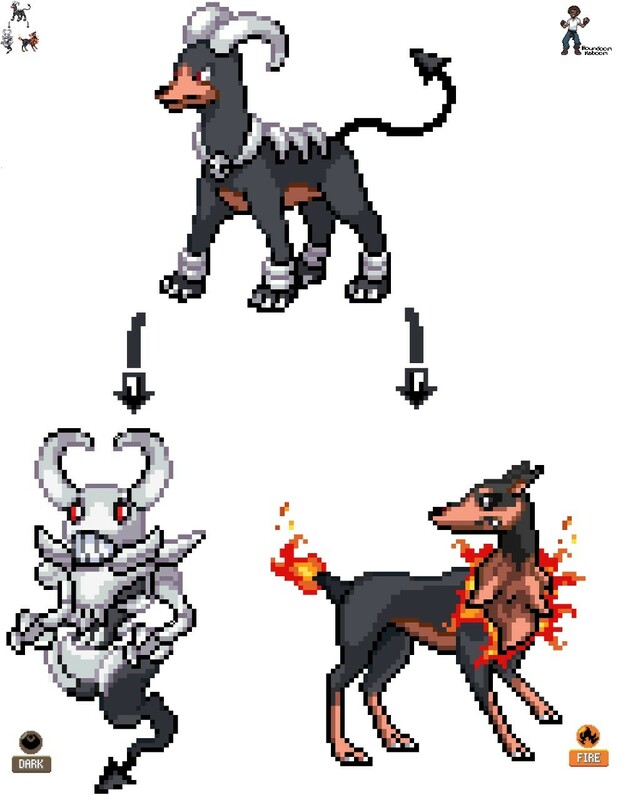 The user houndoom-kaboom on Tumblr made a Houndoom defusion, citing the Latias defusion in my gallery as inspiration. I think it'd be pretty cool if Pokemon Defusion becomes a trend. I'd love to see more of this! I'm still getting this surge in pageviews which I'm pretty sure I don't deserve. I've sent a ticket to the Help Desk, in case it's a bug. Update 4: Okay, we're back to normal pageview numbers. Apparently, it's not a bug, so it'll remain a mystery. While I've never been particularly motivated to keep a deviantART journal updated, I am still quite active on the site as of this entry. I admit my time is being increasingly divided by my vocation and obligations, so you probably won't lose much by not watching. On the other hand, I appreciate those who are interested in my foray into digital painting, 3D art, and music. It's more mundane than pixel art and Pokemon, but it's definitely nice to stretch my creativity and learning. If you still want to see sprites from me, commissions are still technically open. Don't mind me if this journal entry stays up for a year like my previous one. Stuff is still happening. I'm surprised by the number of the active watchers that sent me 'happy birthday' messages; I give my heartfelt and personal thanks to everyone. dA cultures a great open community, I must say. Well, thank you for sticking with me, all 950 of you. Your appreciation for pixel art and tolerance for the other media I wet my feet in encourages me to continue my work. Hey, artists! Pokemon project! Giveaway concluded. How many Pokemon artists are interested in having their art be used in a Pokemon game? How many of you know about Pokemon Showdown!, Smogon's Pokemon battle simulator? As you might know, Pokemon X and Y is planning on migrating from 2-D sprites to 3-D models. The problem with that for Pokemon Showdown! is that it would require reworking the entire simulator for those 3-D models. Nintendo, which has fully-staffed programmers, has the manpower and time to rewrite Pokemon's code or create a game from scratch. Smogon does not. However, it does have the contributions of a Pokemon fanbase that can design sprites for Pokemon Showdown!. What does the project entail? Sprites, of course! Pokemon Showdown! needs front, back, shiny, and animated sprites for all of the Pokemon coming out in Gen. VI. The XY Sprite Project is starting off well, but it could be even better with the help of Pokemon artists (not just spriters) from deviantART. Anyone that can draw can help with making front and back poses for various pokemon, and spriters from all skill levels can pixel those poses or work from scratch. It doesn't matter if you've just started art or if your work has been in published games; anyone can contribute! If you're adept enough to provide amazing pixel animations for each Pokemon, go for it! If you're happy recoloring sprites into their shiny palettes, go for it! I personally use Windows XP's version of Paint for my pixel work and GraphicsGale (it's free) for animating. Other people use Paint.net (free) or other specialized pixel art programs and Adobe Flash (not free) for animation (just make sure to change interpolation to nearest-neighbor to imitate that pixel-y appearance). There's no need for fancy graphics programs, though. Just as long as it allows you to make discrete pixels and GIF/PNG files. Congratulations to Apwolf, who received a one-month premium membership! Half of you probably skipped over those paragraphs and wondered what this 'point giveaway' is. No worries! It's like the other point giveaways on dA; just add this journal to your favorites. That's it! You don't even have to watch me or give me a llama (though that'd be nice)! After an arbitrary amount of time, I'll use an RNG to select a person on the list of people who have fav'd this journal entry and give him or her the same amount of points as the number of people who fav'd it. If 100 people fav' this journal, I'll give away 100 points. If 2,000 people fav' this journal (! ), I'll give away 2,000 points. Oh, and today also happens to be my third year on deviantART, on the nose. That was on 9/9/09, a date I chose solely because of its pattern. As a reminder, as I mention in every journal entry, commissions are open. You've missed a secret in one of my last ten deviation submissions. It's nothing spectacular, but still! Edit/update: I'll be moving around Gen. VI sprites, so don't get confused if a sprite you like is suddenly in another deviation! Additionally, in about a month, my activity may drop from real life business, just to forewarn you. Commissions are, as always, open! On Pokemon Showdown!, you may be seeing some Tomohawk animated backsprites, courtesy of me with much help from Zracknel. Commissions are, as almost always, open! If you see the Necturna animation on there, you'll know that I made it. Not the actual sprite; that's elementalpenguin's. I've been going through a lot in my life, but I make pixel art when I have the time/there's something on Smogon that requires it. If I had the patience to write a two-page (single-spaced) journal entry accounting everything I've been doing, you'd know what I've been up to. But I don't, so this just a notice to something I've made off-deviantART. I am busy; can I consider my activity to be my norm, rather than such a decline to be abnormal? I've got summer assignments and non-pixel art to work on. I find myself uninspired, otherwise, to do pixel art. If only I can draw hands and poses and perspective, maybe I'll try some new stuff out. I don't suppose anyone can give me tips on those? But commissions are open, as always! I won't give those up when it's a chance to try out pixel art. I should explain my inactivity. Well, I've got day-to-day work to do, which is starting to steal away my spriting time. There's also Terraria, which I've been playing instead of drawing. I do have art I'd like to sprite; it's just I have less motivation. Commissions are still open, though! I take pixel art commissions! I accept both deviantART Points and real-life currency, with the standard 100 Points = $1.00. Point transactions will take place through deviantART's commission widget, and real-life money will be paid through PayPal. I require at least half of the commission's cost to be paid in advance, with the rest of it being paid after the piece's completion. In pixel art, the time it takes to make a piece scales to the square of its dimensions. A 100x100 sprite takes approximately four times as long as a 50x50 one. Hence, to determine how much money is needed to commission a sprite, use this formula (or ask me for prices in your comment). The formula applies only to art pieces smaller than or equal to 200x200 in dimension. If you would like a sprite larger than 200x200, we will have to discuss that separately. Let D1 equal the size of the first dimension of the piece, 0 < D1 ≤ 200. Let D2 equal the size of the second dimension of the piece, 0 < D2 ≤ 200. Note that the price of a commission may change depending on availability. I will place a notice at least a few days ahead of time indicating a price change. For a Point payment, P must be rounded up to the nearest multiple of 10 for the widget. Any difference between the rounded price and the actual price will be returned as change. For a real-life currency, divide P by 100 and round up to two decimal places for the price in dollars. I will give you my PayPal e-mail. Place commissions as comments below in the journal. I am currently taking a break from commissions. I will open them again when I have the time! How do you feel if I open commissions? I've been getting questions on if I do sprite requests; I usually take them on a case-by-case basis, but should I open up commissions for the ease of whoever wants them? I'd only open one, maybe two slots at a time, due to my relative business in real life, allowing both cash and points as payment options. I'll add details if anyone would like to take a commission fro me. Let me cut straight to the chase: I was roaming around Victory Road with Super Repels in hopes of finding a Fire Stone to evolve my Drought Vulpix. I run into the occasional Excadrill, but I flee from them. I wondered if I would find a Shiny one, but I would dismiss that as too chancy. I found one. Afterwards, I found a Fire Stone. One day later, I was breeding Vulpixes to get HP Fighting on them. After I was tired of breeding them, I randomly decided to get a Sturdy/Endeavor Aron. So I got the Rock Head/Endeavor Aron I got from a friend and bred it with a Spanish Ditto, and lo and behold, the first egg hatched was Shiny and had the Sturdy Ability. Oh, and if any of my watchers want to trade or battle me on White, say so. I feel I'm playing on the game too much in comparison to spriting. I have been recently notified by Zilleniose that my oldish sprite edits (splices, revamps) would be a violation of deviantART's copyright policy. Thus, I deleted the images while keeping the deviation pages up as a remnant. Sorry to all who commented and fav'd them. I'll try to get more pixel work up later. So in the meantime, here's the Yume Nikki meme in text form. All of my descriptions are some variation of actual dreams. 1. What does your central hub look like? - There is no 'central hub'. Upon entrance, you are teleported to one of the random worlds. Each of the worlds (except one) is connected to another, so it's possible to navigate through them. 2. What door would you go in first, and what's it like inside? - I would pick School, as it's the world with the most effects--the most useful ones, rather. And there are plenty of hidden areas and characters. 3. What door would you save for last and why? - Woodlands: It's a refreshing area that almost takes away the danger of the ever-present assassin that can pop up at anytime, instantly waking you up (unless you've activated the Invisible effect). The dream character present there would be an Ensemble Darkhorse. 4. Is there a specific secret in your world you'd like to share? - Sort of. The secret area, Sand Carnival, can be visited at any time, with a 1/10000 chance of being pulled into a random pit of quicksand with each step you take (unless you have the Float effect activated, which you just float above the now-visible pit until you take off the effect.) But each world has some sort of secret. 5. What ability(s) are you able to use? 6. Do you have any themed areas? - Well, my dreams are drawn from real life, fandoms, and preferences, so everything as some sort of real-life connection. I'm not overly abstract. 7. What would one of your defining areas or events be? - In the Australia world, if you talk to the bowl-haircut blonde girl, she has a small possibility of activating the only full-screen cutscene in the game. If you talk to her and you don't see it, you get teleported to a random world, so trying to actually have the full-screen image occur is a challenge in itself. 8. What happens when you've completed everything? - The character wakes up, goes to her computer, and uploads her ideas onto the internet. No horror, no diabetes-inducing sweetness, just a decent ending. Real Life: You are in your character's bedroom, which has lavender walls, a lamp that can be turned on or off (either way, there is a sun outside), your bed, and a desk with a computer. The computer is where you save your game. There is a door to go to the other rooms, but if you try to open it, you'll get a comment lampshading that this is a game about dreams, not real adventure, and asks you to finish the game before you go outside. Thus, the bed is the main attraction. Sleeping in it transports you to any of the worlds except the Sand Carnival. School: Is separated into two parts: The young area, and the old area. The young area is of mostly light orange-red color with a complimenting white, with slight childish scribbles on the walls. There are highlights of green as to not make it disturbing. In the young area, there is the party room and cafeteria. The Float effect is found by running the full length of the main hallway back and forth. The gymnasium, which has the Demyx event and Skates effect, connects the young area to the old area. The old area is slightly darker, with more green than red. One dream NPC you can talk to idly, or if you have the Crazy Eyeballs effects out, sends you to an event. In both areas, there are tens of classrooms, but only two have anything of significance. Most classrooms have a teacher and maybe students; the one that has the event dream NPC looks no different from the rest, so have fun trying to find it! The School NPC event in detail: If you talk to the NPC with the Crazy Eyeballs effect, the screen goes dark, and then you appear in a parking lot, next to a car. The NPC shoves you in and you are sent to the Restaurant, a small world inside the main world. If you talk to the NPC once you arrive, and if you haven't gotten the Painting effect already, he will give it to you. If he's the one who gives you the Painting effect, you can talk to him again to continue idly chit-chatting. If you already have the Painting effect, he will become mad and attempt to chase after you. If you get caught, you awaken, but if you manage to avoid him for 15 seconds (by either running or activating the Invisible effect), two other NPCs will come and capture him. The School has an entrance to the Business Building inside the main office, while there is a room in the young area that leads to the Beach. Beach: Unlike most areas of the game which you navigate on the X/Y axis, the beach is limited to one axis. You travel left or right around the beachside and stand next to a door or characters to interact with them. The Beach itself is very calm, with the sun in the sky indicating it's afternoon. There are seagulls for scenery which don't do anything. If you loop the area a few times, you might find a NPC there. Whatever effect you have when you talk to him, he will turn into a selkie. He doesn't harm you or give you an effect or anything, though. In the Beach world, there are doors to the School and the House. House: The house is a relatively small area (not an endless void like most) that has five rooms--the living room, kitchen, bedroom 1, bedroom 1, and the bathroom. There are no human characters in this world, but a cat roams around the area. You can actually pick her up and put her on the kitchen stove and incinerate her as she pitifully meows. If you wait a few moments for the cat to fully burn, she will turn skeletal and start following you into different worlds until you wake up. Surprisingly, none of the other NPCs in the game notice the cat. The living room has a television that you can flick on to see random masses of fluorescent colors, and the door leads to the Beach. Bedroom 1 looks exceedingly familiar--that's because it's the character's real-life bedroom, just in a different art style. Sadly, nothing happens if you sleep in the bed. Bedroom 2 leads to the Theater and has the Coat effect on one of its closets. The bathroom is just scenery. Theater: A very broad area consisting of several thousands of seats and a stage, the area is prominently brown with yellow garnishes, with the stage having polished oak floors, ribbons of red velvet curtains, and a row of yellow stagelights above. One of the balconies has an old lady, who if you interact with her, the screen becomes red at the edges, and you get the Crazy Eyeballs effect. The Theater's exit connects to the House. The stage itself is set up to replicate grasslands, with small shrubs. If you run through the shrubs, you may encounter a fight woosh and encounter a four-tailed Ninetales in 'battle'. Your battle options are 'Effect', which brings up the list of effects, and 'Flee', which dismisses you from the battle. Using the Crazed Eyeballs effect kills the Ninetales, the Flat, Skate, and Invisible effects makes the Ninetales miss its moves, and the Painting effect lures the Ninetales in. The rest of the effects do nothing. There's no effect given by the Ninetales, just the interactions. There is a door backstage that leads to Australia. Australia: Possibly the most unsettling world in this game, it resembles the White Desert of the original Yume Nikki. The vast land is a beige shade, and the scene is composed of calligraphic outlines, mostly in the horizontal direction. There is an area where these 'outlines' form a confusing maze--this can be avoided, though some like to get through it to see the strange bulk at the end. Outside of that, there is a door that leads to the Coliseum, and the bowl-cut blonde girl. Talking to her first gives you the Flat effect. After that, she can teleport you to any other world except the Sand Carnival, and may lead to the full-screen event. Most of the land is barren, though, so there's not too much to explore. Coliseum: In the style of the Greeks and their combat, this area is mildly large. The art style here is normal, unlike Australia, composed of dusty yellows. You might find one or two characters here: a man with auburn hair and a kukri, and possibly, a man with long, braided hair, with a shield. Talking to the auburn-haired man teleports you to the Woodlands, and talking to the long, braided-hair man causes him to merge with the auburn-haired man. This does nothing, as he still teleports you to the Woodlands. There are no effects in this area. Woodlands: A stretch of mixed deciduous and coniferous forest, a breeze sways by and sends bits of leaves onto the ground. The auburn-haired man is here and talking to him sends you back to the Coliseum. It's recommended you have the Painting effect out in this world, as finding the Invisible effect without it takes a long time, which puts you at risk of encountering the assassin. If you choose not to use the Painting effect to find the invisible man, you have to check every single square in the world--he isn't ethereal, but if you have an infinitely looping world, landmarking wherever you are is utterly tiresome. There is a door here to the Castle. Overall, the Woodlands is plain and calm, as long as the assassin doesn't come in. Castle: A grand, medieval-styled castle with marble walls, a moat and drawbridge, and chambers for the would-be royal family. The main room has six grand columns stretching to the high ceiling, which is painted with a Michelangelo-esque secular image. The door to the princess's room leads to the Woodlands, and the door to the prince's leads to the Business Building. There are other rooms in the castle, including a throne room, a jailcell, library, and dining hall. The dining hall has a series of images about the royal family, and clicking on the last image in the line grants you the Painting effect. Inside the library, there is a stick figure NPC who is reading a book by the window. If you try and talk to him, he will ignore you. You either need the Crazy Eyeballs or Painting effect to get the effect from him. If you use the Crazy Eyeball effect, the stick figure screams and drops a potion. If you use the Painting effect, the figure nonchalantly gives you the potion and continues reading. Either way, you get the Long Hair effect. Business Building: A moderate, steel-gray box filled with modern computers with wires sticking out every which way, a presentation room with a projector, a meeting room, surrounded by a plain cement sidewalk. Using the Skates effect on the cement sidewalk causes a unique sound effect heard only in that part of the game. Checking the computers there opens up a browser window to this deviantART page. The presentation room shows a series of images that seem to originate from video games. The meeting room has an NPC that does nothing but indicate you've met him when you save the game. The top-middle door leads to the School. - Sand Carnival: An overly humid, rippling festival with mostly sand-like colors, some fancy oranges and blue-greens on the tents. This area is quite large and crowded in buildings, and has hundreds of anonymous NPCs. There are various minigames at each stall, and the assassin can never appear in this world. If you manage to enter this world, enjoy the stay, because it takes more than five pinches to wake yourself up. More detail on the assassin: He's a random, shadowy figure that also has a 1/10000 chance of appearing beside you each step, who automatically wakes you up on contact. He is not meant to frighten, just upset gamers. One of the fifth-generation pokemon is named Lampent. (quanyails.deviantart.com/art/L…) I especially commented that it was not a parody or some indication toward a fifth-generation pokemon. And then, the English names of the fifth-generation pokemon get revealed, with the chandelier pokemon's middle stage being called Lampent. This wasn't the first time similar names occurred with the revelation of pokemon, though. PEQUEDARK-VELVET had a fakemon named Pidove. Pidove was then released. ~ Post these rules on journal entry. ~ Each tagged person must post 10 things about themselves in their journal. ~ At the end, you have to choose and tag 10 people and post their icons in your journal. 1. My usual artistic tool of choice is Windows XP MS Paint, with a mouse. I have Photoshop 7.0, but I usually only use it for transparency, and Imageready 7.0, for the rare animation. I use every tool in the MS Paint disposal, including secrets to exploit. 2. I have a habit of skipping from fandom to fandom, but only occasionally picking up a character to fan over. How long I stick with a fandom depends on how much fan material there is about it and if the medium is finished or not; if the medium is complete, then I leave satisfied. If not, I dissipate from the fandom if no updates continue to rejuvenate me. 3. Though I sprite, I've been wanting to put up some of pencil sketches up--mostly of people--but my artistic skills don't satisfy my wishes. I have anatomy down; it's mostly I can't draw expressions or poses too well. I suppose I tend to overachieve. 4. I suppose I'm a savant in the media I'm lured in. It's a curse, almost, since this means I can identify exactly which artist animated a certain episode of Yu-Gi-Oh! and get irked of all the bad artists. 5. I loathe much of fandoms, ironically. From the fandoms I've been drawn to, well, deviantART has a lot of derivative art on the fanned media. I find those disgraces to the media's original intention. Though, this makes me exuberant when I actually do find good artwork out of Sturgeon's Law's filter. 6. Heh. One can blame most of this savant knowledge to TV Tropes. It indeed ruins and enlightens a life. It's like Wikipedia, where people explain their intricate knowledge of a subject, but unlike Wikipedia, I find it easy to digest and find a place for it in my neurons. Also unlike Wikipedia, there's little application of this knowledge outside similar fields online. If there is another troper in real life I meet, well... that's a huzzah for Sein Language [sic]. 7. I have a habit, whether I want to or not, of making my writing garrulous. This is a writing/typing phenomenon mostly, since my speaking skills are not up to par. With writing, I'm able to think before I say what I think (get that?). Dialogue does not allow for these breaks. 8. I am very analytical when it comes to metasubjects, and I frequently think about what I think about. How many other people think about this recursiveness? Well, I do. I think about these things as if experiments, almost, and see if I can predict how these metasubjects react in later life. 9. I can be eloquent and rough within a small time span. Tropers know of this as Sophisticated as Heck. I do not lean toward either extreme--I am not the random, memetic, controversial loudspeaker or am I flat as a slice of crystal lattice. This is one thing dialogue-wise I can assume more than writing-wise; retorts and rebukes are made much more crude. 10. I have this... almost sinful habit of being condescending if something irritates me. I never use pejoratives--only when talking about these words themselves, not used in actual communication, but prefer to substitute a higher form of comment. I had had one occasion that that backfired (wordplay before), about experimenting on perceptions on written words by changing the tone of a paragraph, with few changes in actual wording. In short, I got antagonized and then the argument fizzled. 11: (Extra) My spiels can go on quite a bit if unrestrained, but I lack the ambition to finish them if time becomes an issue. Since time isn't, currently, you see before you a few paragraphs' worth of thought. How's that for '10 things about me'? No tags, unless you want to write something of this stature. You will probably be seeing more fakemon sprites by PEQUEDARK-VELVET in my gallery from now on. If you like them, like them. If not, feel free to ignore them. [ ] You've made a charabento. [ ] Touhou rocks your life. 20-30: At this stage you probably still hate weeaboos. Good news - you're not one. Nov 2, 2015 It's happening again! Jul 28, 2015 What did I miss? Sep 9, 2013 Hey, artists! Pokemon project! Giveaway concluded. Jun 12, 2013 Comment problem fixed! Feb 18, 2012 I should explain my inactivity. Oct 25, 2011 How do you feel if I open commissions? Mar 25, 2011 There go fifteen images. Mar 19, 2011 Sorry 'bout my inactivity. Feb 2, 2011 Well, that's odd.